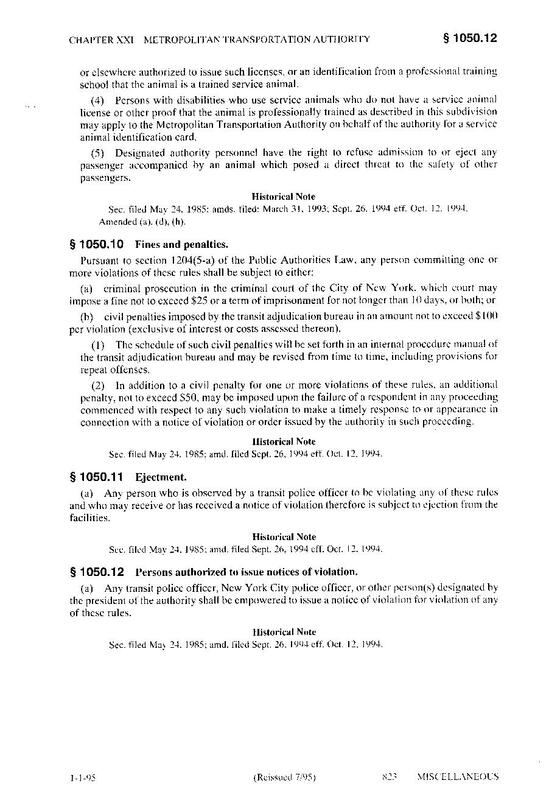 Update: Sometime since 2010, the State of New York made an "unofficial" version of the NYCRR available via Westlaw. You can read the latest version here, assuming they don't break the URL. 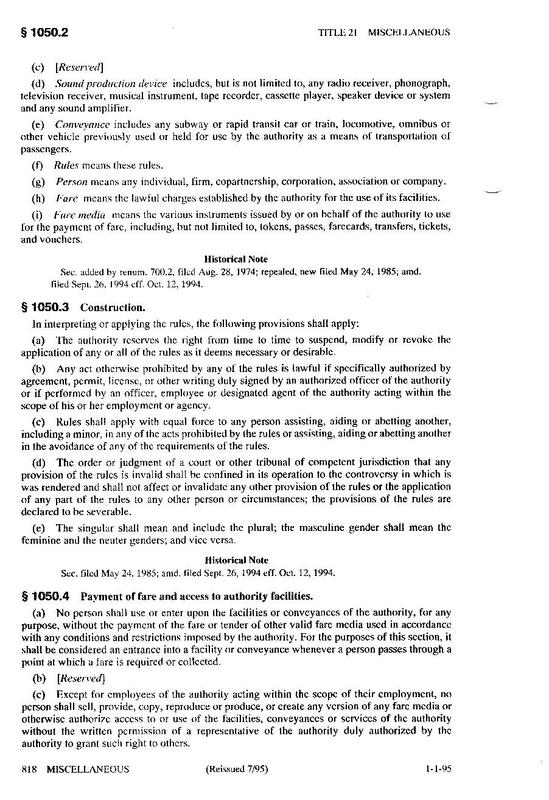 The only change appears to be the addition of 1050.13 which discusses the sale of fares. Other than that, I have not compared my copy to the Westlaw copy. 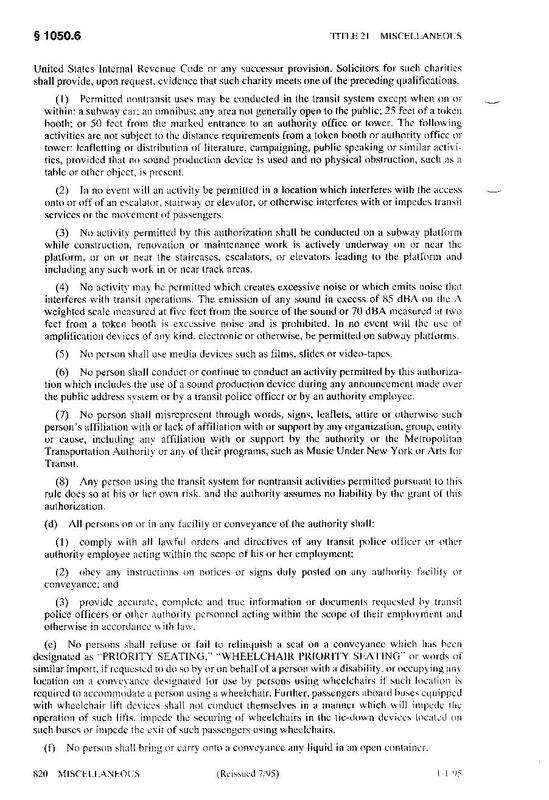 Update: In June, 2003 the MTA posted a copy of these rules on their web site. I have not compared my copy to the MTA copy. The MTA copy is missing the footnotes and effective date info found in the printed text, but perhaps they don't feel that info is necessary. 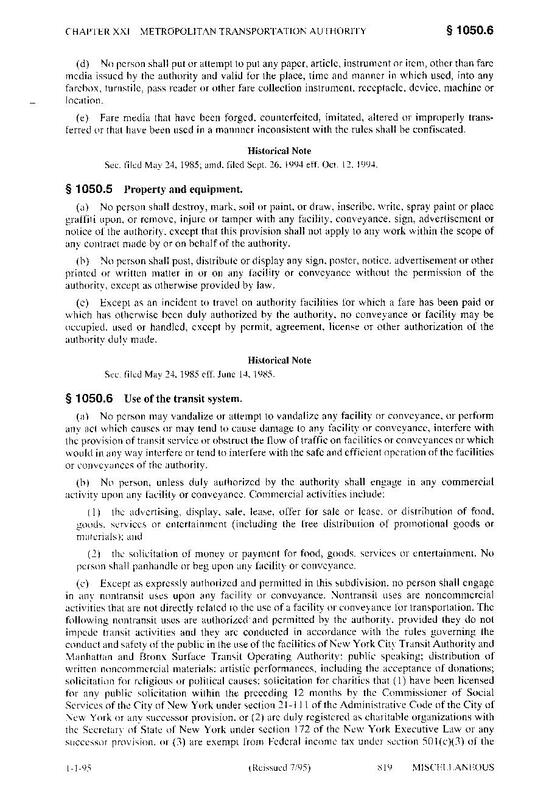 You can read the MTA copy by clicking here. 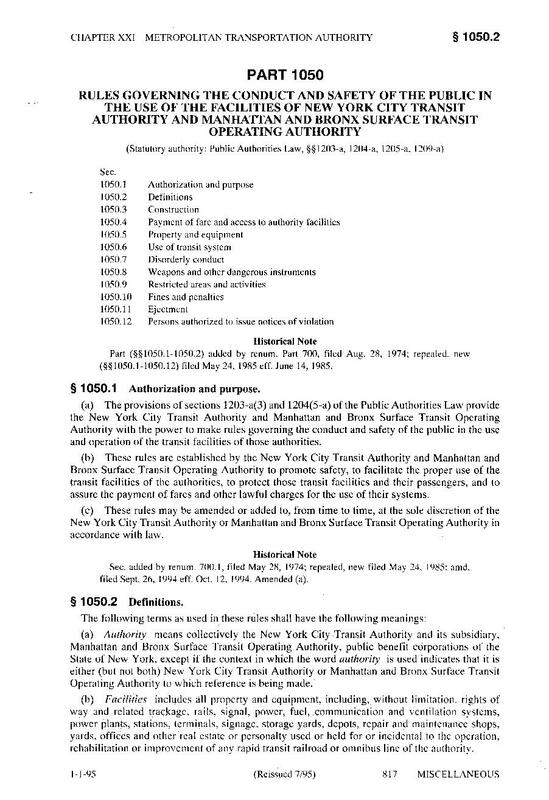 The following 7 images contain the complete text of "RULES GOVERNING THE CONDUCT AND SAFETY OF THE PUBLIC IN THE USE OF THE FACILITIES OF NEW YORK CITY TRANSIT AUTHORITY AND MANHATTAN AND BRONX SURFACE TRANSIT OPERATING AUTHORITY". 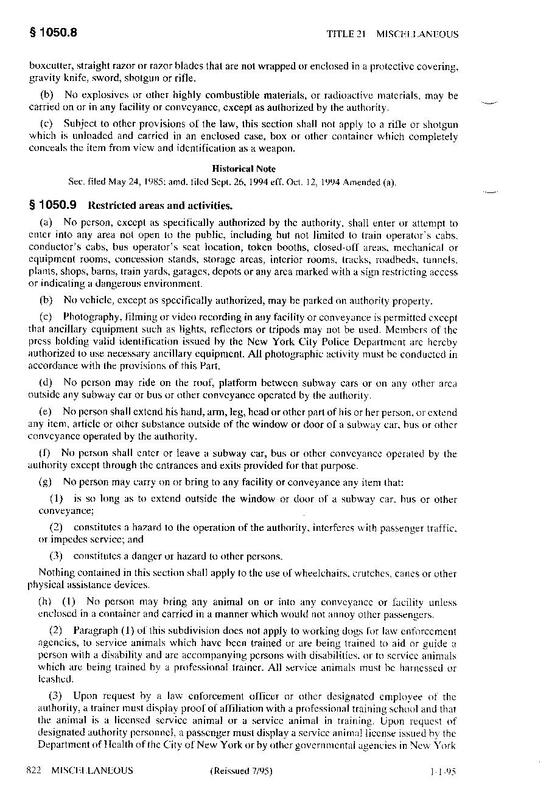 Due to the large number of times discussions about whether an activity is or isn't permitted in the subway/on buses, I purchased a set of NYCRR for the purpose of settling this once and for all. 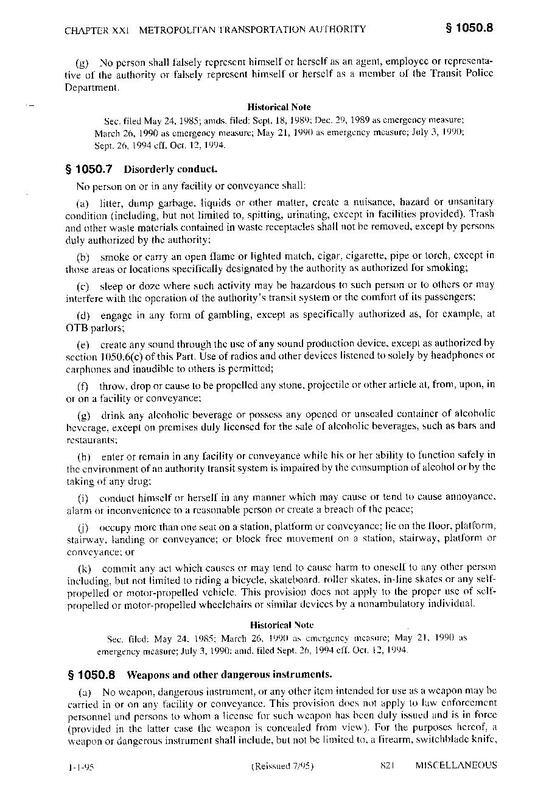 Note that despite these pages being marked "1-1-95 (Reissued 7/95)" these are the current pages as of February, 2000. I'm told the New York City Public Library has one copy of these if you want to see the originals for yourself. Most NY law firms should also have a copy. For info on purchasing your own copy, see the NY State web site. The original .TIF scans are available here. Note that these are quite large files (for printing on 8.5x11 paper on a 600 DPI laser printer). Additionally, a .PDF of the 7 pages is available here. Accessibility Policy 27 hits this week, 29868 since 8/31/2000.